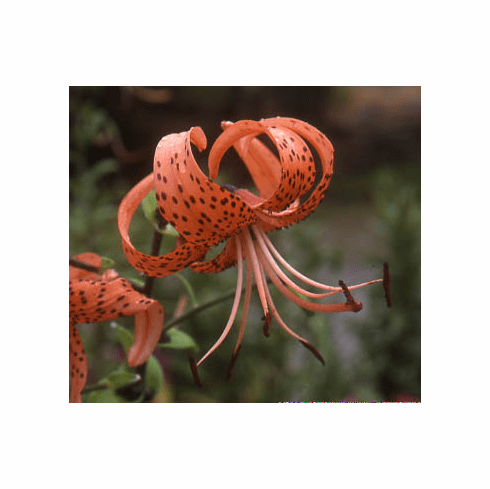 Oni-Yuri, the Japanese �Tiger Lily� was common place in the Victorian gardens of old. Not as readily available now from commercial sources as it is a host plant to many diseases and is thus avoided by nurseries working with much more delicate species. The pendant, orange-red flowers carry numerous brown to black spots. Producing many black-brown axial bulbils, they are fully ripe and have already begun producing roots before dropping to the ground in the late fall. Easily grown, they rarely need to be lifted and divided. It is not recommended to grown Lilium tigrinum if you are growing any other species as aphids will pass along numerous virus infections from Lilium tigrinum to your other plants. This is a �Typhoid Mary� in the garden. Susceptible also are all other plants growing from a bulb or tuberous root along with your roses. We have never offered this lily because of the damage it has the potential to inflict on your other garden subjects. Photo insert #1 is of the 'Old World Swallowtail' (Papilio machaon) feeding on this species in natural habitat at in Mount Kisokoma, Nagano prefecture, Japan. Photo taken by Alpsdake. Source WikiMedia Commons. This file is licensed under the Creative Commons Attribution-Share Alike 3.0 Unported license. Photo insert #2 is of 'The Long Tail Spangle' (Papilio macilentus), also feeding on this species in natural habitat at Shiga Prefecture, Japan. Photo taken by Alpsdake. Source WikiMedia Commons. This file is licensed under the Creative Commons Attribution-Share Alike 3.0 Unported license.